Who is Voices of California? 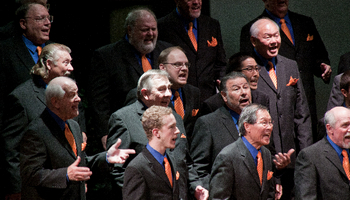 Voices of California is a world-class male performing ensemble who create harmony through performance, fraternity, personal growth, and shared musical experiences of the highest caliber. 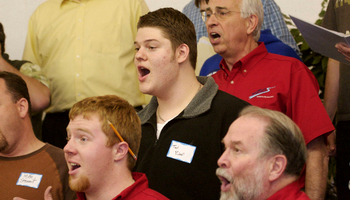 We love singing a cappella music, primarily in the barbershop style. We educate and inspire to ensure each member's continued musical growth, and we work to foster singing in our communities. We are a chapter of Barbershop Harmony Society. Based out of the Sacramento valley, our members come from all over Northern California to have fun and to create great music. The chorus has a passion to entertain, and our high-energy performances are memorable for both their vocal and visual impact. Our director is the wonderful Gabe Caretto, who inspires us to reach new heights at every rehearsal and then again with each performance. We can be heard throughout the year, singing for civic and charitable organizations, private groups, churches, community events, and fundraisers. All our rehearsals are open to the public and to potential new members, so why not pay us a visit. We rehearse every Thursday evening at 7pm, at Adventure Christian Church, 1500 N Market Blvd., Sacramento, CA 95834. Want Voices of California to sing at your next function? Why not hire Voices of California to entertain at your next event? We can perform at corporate functions, charity events, community Entertainment events, birthday parties, christmas parties, awards nights, weddings, engagements, anniversaries, engagements, and even funerals and memorial services.